The last lab we used automated task reassignment to fix the problem of users claiming a task from the group and then not completing them in a timely manner. This week we tackle another issue where new tasks are arriving for the group to process, but without a notification no one in the group is aware of waiting tasks. Adding e-mail notifications for user tasks. To fix this new issue, we can setup automatic e-mail task notifications for the group. Every time a new Approve Rewards task arrives, someone from the group will have a set time limit to claim the task or an e-mail notification will be sent. Last week there was a two day JBoss BPM Masterclass in the Nordic country of Sweden for a select group of partners. This was a chance to spend two days covering the entire spectrum of rules, events, planning and processes. Not only did we have the introduction of the materials, but as much time as possible was set aside for hands on working with the products to build an online web shopping experience and a replication of the Red Hat employee rewards process. Complete introduction - we kicked off with the promise of attendees being able to hold a discussion and explaining what rules, events and processes were to anyone they might run into inside of 10 minutes. We then delivered on this promise. Starter kits - the course also introduced the JBoss BRMS and JBoss BPM Suite starter kits to the attendees as a starting point for anyone looking to kick off into the world of rules, events and processes. Getting hands-on in the Cloud - finally we spent time looking at how the attendees could make use of xPaaS, OpenShift and bpmPaaS to leverage rules, events and processes in the Cloud. All of this was done by following the online workshop (see below), which you too can now participate in by following the link. 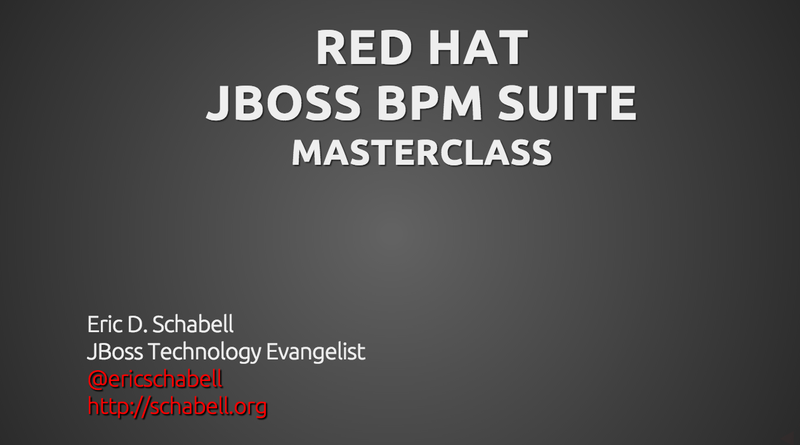 We invite you to spend two days with Red Hat expert and learn about JBoss BPM Suite. This two-day master class will prime you with the knowledge you need to understand the capabilities, components and basic concepts involved as you start leveraging process and rule-driven solutions. We will focus on business process management (BPM) concepts, explain how to capture your enterprise's logic in business rules (BRMS & BPMS), and cover what complex events can bring to your customer experiences. All attendees will be left with an understanding of how rules and events are handled in a project , where to position business logic and understand the value BPM can bring to their organization. Keep your eyes open for the next stop on the JBoss BPM workshop tour in a town or country near you. Last week I spent the better part of my time with some fantastic people that run a JBoss User Group (JBug) in Scotland. 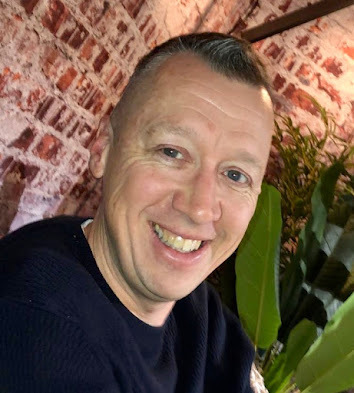 Up to now they have been pushing it pretty hard in Edinburgh, Scotland and with some success as I found out when I showed up with my JBoss BPM workshop. We had a room full of attendees, a lot of beer and pizza and some great technical hands-on content around JBoss rules, events and processes. They got more than their moneys worth as we introduced the concepts, loaded up their machines with JBoss BRMS & JBoss BPM Suite and started building the Cool Store / Rewards projects from scratch. Most of the event was filmed so expect them to post this soon and will link it back in here when they do. 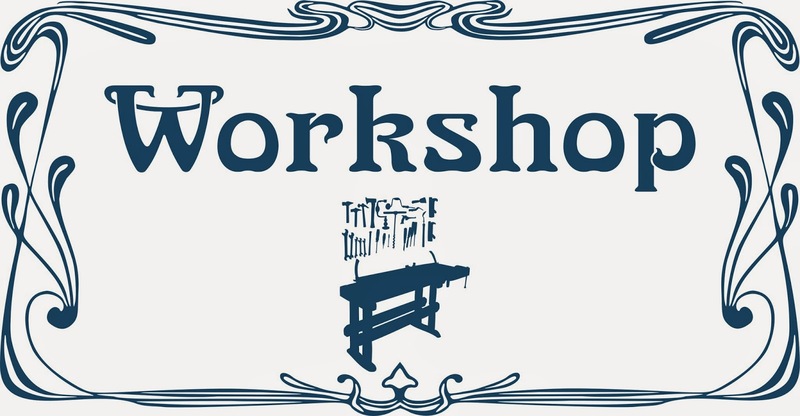 The workshop they followed is available online, so feel free to enjoy the same hands-on experience they did. After this fine evening I jumped a train to the next major town, Glasgow. 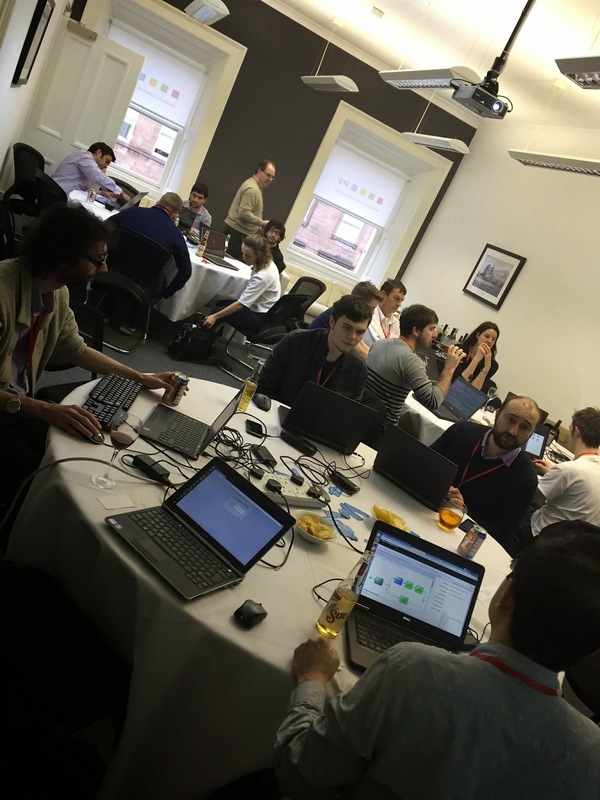 Here we launched the inaugural Glasgow based JBug which was a pretty good event with another full room, showing that they are more than ready to have their very own JBug in Glasgow. Some good reactions from the participants and a very fun bunch to hang out with afterwards at the local pub, so would recommend giving it a try next time you are around Scotland. If you are a speaker that has something interesting to tell around JBoss technologies, reach out to them, you won't regret it! Here are a few impressions of the events. @ericschabell last night's packed @JBUGScotland in Edi had amazing feedback, sure #Glasgow will be fab too! @PartyTime72 is on her way! Thanks @ericschabell @JBUGScotland @PRGRecruitment for last night's talk. 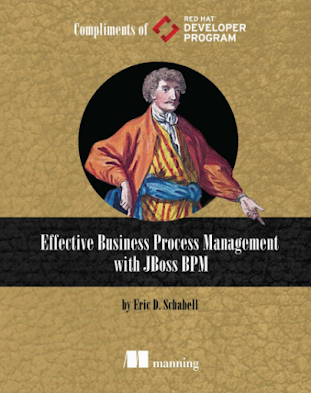 Will be considering jBPM and JBoss BPM Suite for future projects! 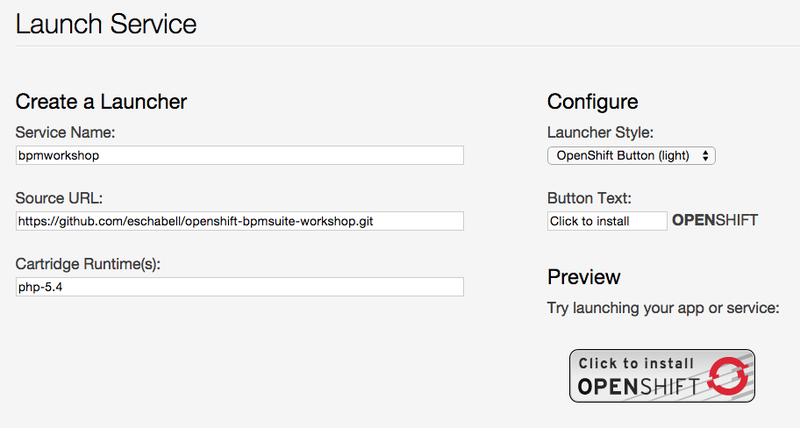 Today we launch a brand new Red Hat JBoss BPM Suite demo project called JBoss BPM Baggage Delivery. 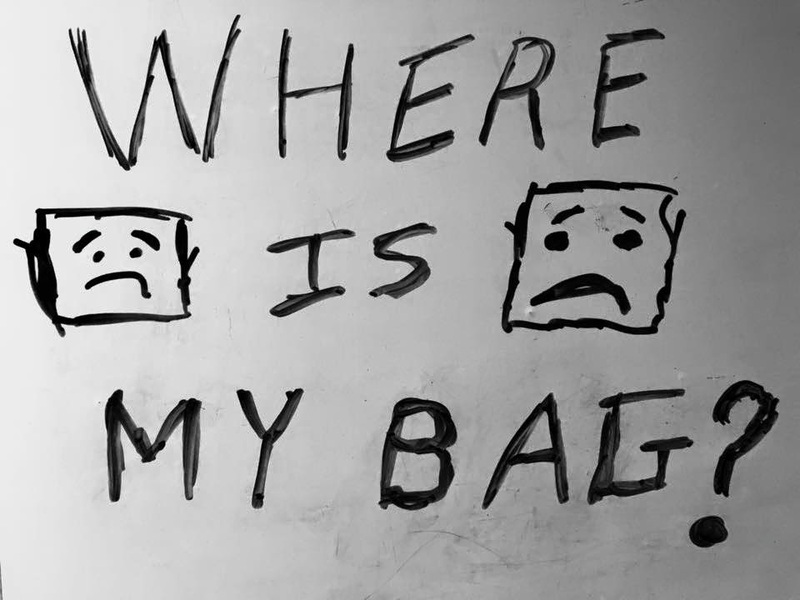 Anyone who has travel with airlines has at one point or another arrived at a destination only to discover that their bags did not. We shamble over to the lost luggage counter, fill out forms, supply our address, describe the bags lost and head homeward empty handed. Hopefully within a day or two the airline will find the missing bags and deliver them to the address supplied. In this demo we capture this experience and solve some of the (fictitious) problems in rules, tasks and process with JBoss BPM Suite. The JBoss BPM Baggage Delivery project is quite easy to get up and running, just a few steps and off you go. 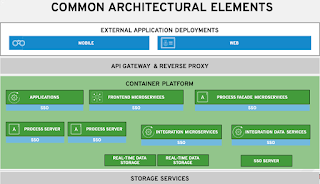 If you prefer you can also setup in the cloud on any OpenShift Container Platform, all options are detailed in the projects readme file. The project simulates a traveler submitting their name, frequent flyer status, and shipping information in the short form of just your Country and zipcode if you providing the USA as your home. 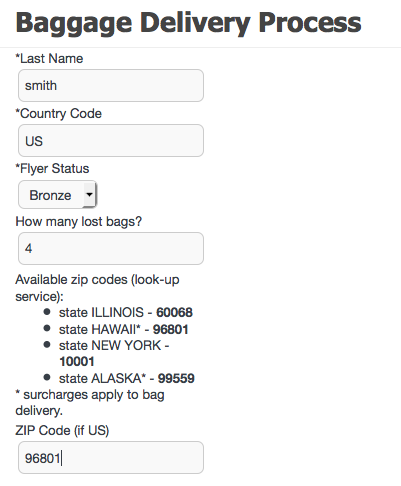 The submission form provides textual help to give you zipcodes that the lookup service in the process uses to discover your home state if country provides was the USA. Rules are used to determine if there is a surcharge (we dreamed that up for you) to have your bags delivered to remote locations like Hawaii and Alaska. If you are not in the USA, then there is a path take to check the surcharge on the external spreadsheet based decision table, which you can verify in the spreadsheet provided. Your exact address is leveraged from the fact that you are a frequent flyer and if you have gold status or above you never have surcharges on baggage delivery. We hope you enjoy this extension to our travel theme projects.